Acupuncture is a hands-on technique that identifies each person’s energy flow in their channels. By using prescriptive points to reconnect all the different points of the body’s meridians, acupuncture wakes up the body’s own healing abilities and strengthens the body’s innate power of reaching homeostasis. We use various techniques and approaches to maximize the effects of acupuncture. For example, while most people respond well to body acupuncture, some will respond exponentially better to auricular or hand acupuncture. In addition to the health benefits, acupuncture can also be used for beautification treatment. By reducing and even reversing the signs of aging, it is quickly becoming a popular modality for facial rejuvenation. 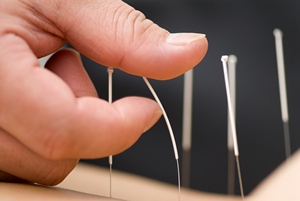 Acupuncture needles are completely different from needles used in conventional practice (i.e. injection needles). Many people may fear acupuncture because they are afraid of the needles or imagine acupuncture to be painful. Actually, the thinness of acupuncture needles can be compared to a strand of hair, and they are extremely smooth. This makes for relatively pain-free insertion. You may sense a slight sensation at the moment of insertion (more so if you are a child, tired, or weak). The majority of people will experience a sense of great relaxation and well-being during the process. At Healing Power of Nature, we only use disposable needles for each treatment, so there is no risk of transmitting communicable diseases. Need More Advice on Our Acupuncture Treatments? There are two kinds of explanations about how acupuncture works. I would like to give a traditional explanation. In traditional Chinese medicine, there exists meridian system through human body and more than 360 acupoints are located at these meridians. Qi, or a stream of energy, flows through these meridians and acupoints to support tissue, muscles and organs. When the Qi is obstructed in certain critical points, or acupoints, the function of tissue, muscles and organs will be impaired. By inserting acupuncture needles into acupoints helps the release of Qi flow and corrects Qi imbalances at the organ level to improve your energy and internal processing. Since acupuncture promotes the body’s natural healing ability, many conditions can be corrected or improved. Also, it is being recognized that acupuncture is a comprehensive system of preventive health care and health maintenance. The effectiveness of acupuncture extends far beyond the conception that it is only useful for chronic pain management or as an analgesic. It has been discovered by many athletes that acupuncture treatment helps them to reach optimum performance levels. Recently acupuncture detoxification treatments have been recognized as a valid form of therapy for chemical dependency problems such as drinking, drug and smoking. Throughout its long history, acupuncture has established a solid reputation as an excellent alternative for health care. Pain Relieve and Control – It is well proven that acupuncture can treat many types of pain conditions such as Arthritis, Cervical Spondylopathy, Knee Pain, Hand and Foot Pain, Sciatica, Shoulder Pain, Tennis Elbow, Lower Back and Neck Pain, Tendonitis, etc. More than half of my patients who suffered from different pains visited my office. Most of them have received satisfied treatment results. I have some patients who suffered injury due to car or sports accidents. They are also very pleased with acupuncture treatment. Quit Smoking – It usually takes three to five sessions of acupuncture treatment to have smokers to quit. Other Conditions – I have successfully treated other diseases and conditions such as Anxiety and Depression, Facial Paralysis, Insomnia, Neuralgia, Stroke Rehabilitation, TMJ, Whiplash, etc. Yes! Because now acupuncture is carried out with sterile and disposable needles approved by FDA. Normally, each session takes 20 to 30 minutes. It depends on the sensitivity of each individual and the kind of diseases and conditions. In general speaking, the quality of acupuncture treatment relies on the experience and skill of an acupuncturist. They are combination of diagnosis of symptom, accuracy of acupoints, timing, the depth and angle of insertion, techniques of manipulation, etc. I can not give you a “yes” or “no” answer. That depends on who is your medical insurance company and what type health insurance plan you have enrolled.